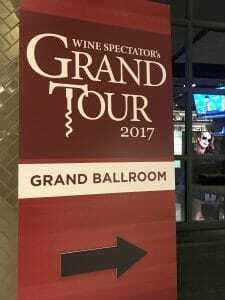 On May 6th, I had the opportunity to attend Wine Spectator’s Grand Tour at the Mirage Hotel & Casino in Las Vegas. Earlier in the day, the 143rd Kentucky Derby was held but for wine lovers like me, the real race that evening was trying to see how many of the 244 outstanding 90+ rated wines we could taste in three short hours. I topped out at 68 wines with that involving making some hard decisions to miss areas that I would have loved to explore more like New Zealand and Piedmont. It also meant missing some of the wines that poured out quickly such as Stag’s Leap Wine Cellars’ 2012 Cask 23 which was gone about 2 hours into the event. Heading over to the Champagne side last also meant missing the Perrier Jouet’s 2007 Belle Epoque by about half an hour. One of the observations I made during the evening was how many truly incredible wines only got 90 points. Historically, achieving 90 points from a reputable wine critic was considered a significant achievement for a wine but now it generates as much excitement in many consumers’ eyes as a baseball slugger who hits only 30 home runs a season. 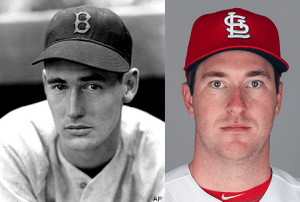 Yeah, Ted Williams’ 30 homers was a big deal back in 1951 but that would have him tied for 32nd and keeping company with folks like Kendry Morales, Jedd Gyorko and Curtis Granderson in 2016. You can partly blame the proliferation of wine critics and wine rating magazines but the truth is that the market is literally flooded with great wine. Advancement in technology and knowledge in both the vineyard and the winery means that consumers have access to more wine of very high quality than ever before. This abundance of choice often means that consumers who focus on critic scores start moving their eye balls higher up the 100 point scale, making wines with scores under 94 points hard press to catch some consumers’ attention. That made me appreciate the beauty of the Wine Spectator‘s Grand Tour even more. This event, billed as a “United Nations of Wine”, showcased not only the breadth of quality around the globe but also, somewhat ironically, highlighted how much quality is not really defined by a number. While Wine Spectator makes its mark dishing out scores for wine, it was very telling that the vast majority of the 244 wines featured at their event had scores in the 90-93 point range, including 61 wines that scored a mere 90 points. Several of these were highly impressive including one that would make my Top 10 list by the end of the night. That is why I’m going to start my three part series on the 2017 Wine Spectator Grand Tour with highlighting some of these Jedd Gyorko-scoring wines that are delivering Ted Williams-like quality. 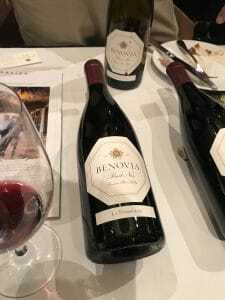 Benovia 2014 La Pommeraie Russian River Pinot noir (90 points. Wine Searcher Average price $59) This was my first time trying wine from this tiny Russian River winery and I was so impressed that I signed up for their mailing list. Beautiful high intensity aromatics that mixed floral and spice elements. The palate had medium-plus dark fruit notes which were well balanced with enough juicy medium-plus acidity to add elegance to the weight of the fruit. In an evening where I was comparing this wine side by side to other highly acclaimed Pinots such as the Belle Glos (2014 Clark & Telephone), Patz & Hall (2014 Hyde Vineyard) and even a Grand Cru Burgundy from Louis Latour (2014 Corton Grancey), this was the best Pinot noir of the night. Clos Beauregard 2012 Pomerol (90 points. Wine Searcher Average price $56) Another first time pleasure for me to try. While 2012 as a vintage is a far cry from the very heralded 2009-2010 or the upcoming 2015-2016, it is, in my opinion, a solid vintage that offers good bargains for Bordeaux enthusiasts who need “Cellar Defenders” that that can open up as younger wines while giving their 09/10s and 15/16s more time to age. This Beauregard from Pomerol fits that bill perfectly in offering soft, but full-bodied and structured, tannins with rich dark fruit with spice and chocolate on the finish. 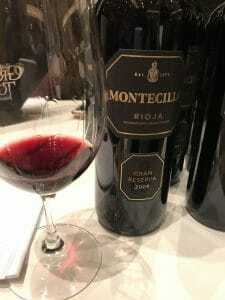 Montecillo 2009 Gran Reserva Rioja (90 points. Wine Searcher Average price $20) Probably one of the best values of the night. Savvy Rioja lovers have long known about Montecillo since it is one of the oldest estates in Rioja and has spent over 140 years making outstanding wines. This 2009 Gran Reserva most impressed me with how well it straddled the line between the modernist, more fruit-forward style of Rioja and the classic, more old-school and oak driven style. The Montecillo was clearly classic with tobacco and oak spice but it had a rich core of fruit that made the wine seem more fresh than a lot of old-school Gran Reservas tend to be. The event features a lot of great Riojas from producers like Muga (2009 Prado Enea), LAN (2012 Edicion Limitada), and CVNE (2010 Imperial Gran Reserva) but I would put the Montecillo second only to the 2007 La Rioja Alta Gran Reserva 904 for top Rioja of the evening. Quinta do Vale Meao 2013 Meandro (90 points. Wine Searcher Average price $21) This Portuguese wine is probably fighting head to head with the 2009 Montecillo Gran Reserva for best bargain of the night. Full bodied with chewy tannins and a long savory finish. Again, this will be no surprised to savvy wine geeks who have already been well aware of the outstanding value of dry red wines coming out of the Douro. Nor will this be a shock to Port lovers as the Olazabal Family’s Quinta do Vale Meão vintage Ports have been raking in critical acclaim for several years now. This wine is a blend of 35% Touriga Nacional, 34% Touriga Franca, 20% Tinta Roriz, 6% Tinta Barroca, 3% Tinto Cão and 2% Sousâo and is almost a “baby brother” to the Quinta do Vale Meão Tinto 2013 that earned 94 points from Wine Spectator and 95 points from Robert Parker. The 2011 version of that wine was #4 on the 2014 Wine Spectator Top 100 wines list. For a $20 wine, this wine punches WAY above its weight and out-shined many bottles that were 3 to 4x the price. 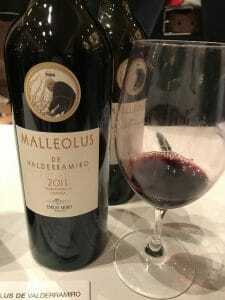 Emilio Moro 2011 Malleolus de Valderramiro Ribera del Duero (90 points. Wine Searcher Average price $85) One of my Top 10 wines of the night. Absolutely stunning wine from one of the top estates in the Ribera del Duero. The nose smelled like dinner at an incredible restaurant with tons of savory meaty character mixed with fragrant Indian spices that can’t help but make your mouth water before taking a sip. The mouthfeel is velvety with oak and black plums mixed with medium-plus acidity that continues making your mouth water with lingering flavors of fruit and spice for a finish that was several minutes long. And that was just from a taste! I can only imagine how many more layers could unfurl if I had a chance to savor an entire bottle of this wine. Montes 2012 Alpha M (90 points. Wine Searcher Average price $64) Another great delivery from the Montes family of Chile. This is a Cabernet Sauvignon dominant Bordeaux blend with 10% Cabernet Franc, 5% Merlot and 5% Petit Verdot which gave this wine a lot of tobacco spice and cedar cigar box notes on the nose. Very Bordeaux-like but it was paired with a palate of ripe, juicy black currant and black plum with a velvety mouthfeel closer to that of a nice Napa Cabernet Sauvignon. 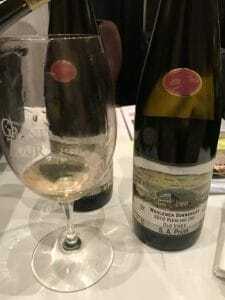 S.A. Prum 2010 Wehlener Sonnenuhr GG Old Vine Dry Riesling (90 points. Wine Spectator list price $47) At the beginning of the tasting the Champagne and white wine tables where crushed as people, logically, sought to try those wines first before moving on to the big reds. In order to maximize the amount wines we could experience, my wife and I made the strategy decision to hit the reds first and then towards the end hit the whites with the Rieslings and Bubbles being palate cleansers. It was a risky strategy but this dry Riesling from S.A. Prum made it a smashing success. Intensely dry with lively acidity that scrubbed all the tannins and extract from the 40+ red wines we’ve had by then right off the palate. It was like a B12 shot for the palate and it awaken my taste buds to enjoy the vibrant stone fruit of white peach and almost salty minerality. Such vivacious life for a 7 year old Riesling that still could go on kicking for several more years! Sbragia 2013 Monte Rosso Vineyard Cabernet Sauvignon (90 points. Wine Spectator list price $65) From the legendary Monte Rosso Vineyard in the Moon Mountain district of Sonoma, it would be a sin to call this Cabernet “Napa-like”. Sure, it has the power of ripe black fruits of a great Oakville or Rutherford Cab but there is a freshness to this wine that I often find missing in Napa. It reminds me of an NFL linebacker who studied ballet. Power and grace. While the winery was founded Ed Sbragia, former head winemaker of Beringer, I learned that his son Adam now heads up winemaking duties. While I always enjoyed Ed’s wine, tasting this wine has me even more intrigued at what the future holds for Sbragia. Ch. 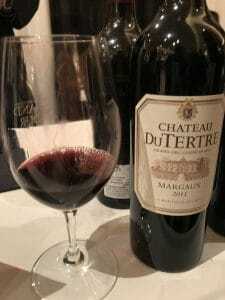 du Tertre 2011 Margaux (90 points. Wine Searcher Average price $42) A blend of 60% Cabernet Sauvignon, 20% Cabernet Franc, 10% Merlot and 10% Petit Verdot from the 5th growth estate in Margaux. In the “Intermission Years” of Bordeaux between 2009/2010 and 2015/2016, the 2011 vintage would probably rank just slightly ahead of 2013 for roughest of this very rough patch. But as I noted with my comment on the 2012 Clos Beauregard, there are still gems to be found but wine lovers need to be realistic. These are not wines to lay down in the cellar for decades. A wine like the 2011 du Tertre has character and personality with its woodsy and black tea notes on the nose. The medium body tannins with blueberries, dark cherry and truffles and medium-plus acidity would shine with dinner featuring game, mushrooms or a hearty stew. Caiarossa 2011 Toscana (90 points. Wine Searcher Average price $43) This is an exciting Italian wine project from Eric Albada Jelgersma, owner of the 3rd Growth Bordeaux estate Chateau Giscours and 5th Growth Chateau du Tertre. A blend of 30% Merlot, 24% Cabernet Franc, 22% Syrah and 4% Cabernet Sauvignon it is an unusual blend even by Bordeaux standards, much less something you would expect from Tuscany. But the Cabernet Franc and Syrah in this wine really sing with a mix of blackberry, violet and peppery spice. On the finish there is some intriguing dark chocolate and espresso notes that pop out. This is a wine tailor-made to impress wine geeks. 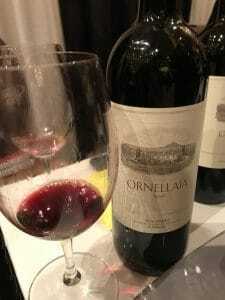 Ornellaia 2014 (90 points. Wine Searcher Average price $168) I was shocked to see this wine as I didn’t even realized it was released yet! One of the classic Super Tuscans, this wine is a blend of 34% Cabernet Sauvignon, 32% Merlot, 20% Petit Verdot and 14% Cabernet Franc. Huge, huge tobacco. There are many cigar bars in Vegas and this wine smelled like I walked into one. It has some interesting aspects but with the big, chewy tannins this wine needs a lot of time. If I had a bottle, I wouldn’t think of touching it for at least another 3-5 years but its best days are probably 10+ years away. Volver 2014 La Mancha (90 points. Wine Searcher Average price $16) For many New World wine lovers, shopping for European wines can be a scary proposition with so many unfamiliar names, labels and grape varieties. One of the easiest thing you can do is to start learning importer names. Flip the bottle around and look at the back label for names like Kermit Lynch, Becky Wasserman, Alfio Morconi, Frederick Wildman and, if you’re looking at Spanish wine, Jorge Ordonez. 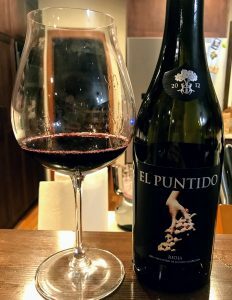 The gems he finds are outstanding such as this old vine, single vineyard Tempranillo that had gorgeous juicy red fruit with a medium-plus body that gave the wine elegance and finesse. Coming up next: The Heavy Hitters and 94+ rated wines. Tagged Alfio Morconi, Becky Wasserman, Belle Glos, Benovia, Bordeaux, Cabernet Sauvignon, Chateau du Tertre, Chateau Giscours, Clos Beauregard, CVNE, Emilio Moro, Eric Albada Jelgersma, Jedd Gyorko, Jorge Ordonez, Kermit Lynch, La Rioja Alta, LAN, Las Vegas, Louis Latour, Monte Rosso, Montecillo, Montes, Muga, Ornellaia, Patz & Hall, Pinot noir, Quinta do Vale Meao, Rioja, S.A. Prum, Sbragia, Ted Williams, Volver, Wine Spectator.